Cotman Watercolours - High quality watercolours at an economical price. A unique 'cartridge' designed to hold half pans and whole pans securely in place. Clips into all Cotman PLUS sets. 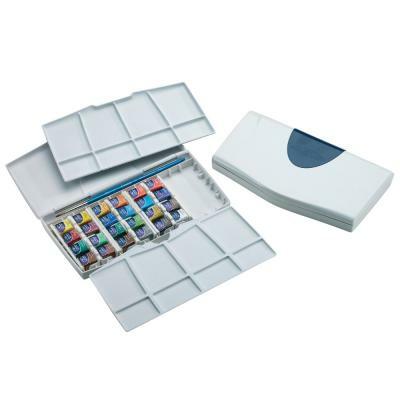 One of the best watercolor boxes I've owned, ample mixing room, compact, and 24 half pans -- plenty of pigments to work with. It is sturdily built and functions well. I have tried it in the field successfully, painting with permission on a local farm. I call it my "maxi" outdoor sketching setup.